Welcome to my HAHAT post! I’m happy to be a part of this hop again, to celebrate and raise awareness of the International Day Against Homophobia and Transphobia. The hop is over 130 strong this year! We’ll be at it through May 24th, which gives you plenty of time to hop around and tell all your friends. Visit as many stops as you can, because everyone is hosting a prize! My prize is a $10 Credit to Dreamspinner Press! All you have to do is answer my question at the end to enter. If you want to Like my FB Author Page that’ll get you another entry. Why you’ll never see me with my asterisk hanging out. It’s become popular to include an asterisk after the word trans when you mean transgender. I get how it started—the asterisk is a wildcard, because not every trans person uses the same modifier. But not everyone is on board and I want to tell you why. 1. a small starlike symbol (*), used in writing and printing as a reference mark or to indicate omission, doubtful matter, etc. 2. Linguistics . the figure of a star (*) used to mark utterance that would be considered ungrammatical or otherwise unacceptable by native speakers of a language, as in * I enjoy to ski. 3. Historical Linguistics . the figure of a star (*) used to mark a hypothetical or reconstructed form that is not attested in a text or inscription. 4. something in the shape of a star or asterisk. Asterisks are commonly used to direct a reader’s attention to a footnote or other explanatory text. My daughter is not a footnote. She also is not hypothetical, doubtful matter, or otherwise unacceptable, thanks very much. I understand the thought process that led to this usage but I don’t know anyone personally who is trans and who isn’t put-off by it. Every time I see it, I have to remind myself not to look at the bottom of the page—because there won’t be anything there. I’m not saying every trans person on the planet has, or should have, the same opinion. I’m only saying that in my experience, the asterisk following the word trans is not something a cis woman such as myself has any business using. I’m not perfect, but I listen, and I try. One more thing before I go. A lot of people I know IRL know my daughter is trans; a lot don’t. A week doesn’t go by without someone saying something transphobic where I can hear it. Many times I can’t call them out on it—the person has power over me in such a way that I can’t afford to embarrass them and/or tick them off. When I do speak up, or often even when I just don’t go along and laugh at the “joke” the people involved look at me differently. And not in a good way. I’m glad this hop exists; we need more events like this, online and in meatspace, and for the events to be inclusive. 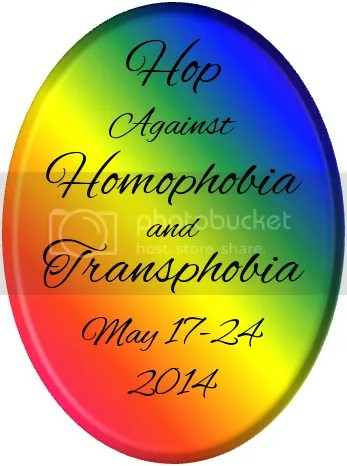 I’d love to see an event called the Stop Bigotry Hop, or the Accept Everyone Hop—or something that’s a little catchier. 🙂 I’m sure it’s possible to figure out a cool title that includes Aces and Bisexuals and Genderqueer folks—the whole Rainbow Brigade. Someday, someday soon, I hope we get together celebrate how far we’ve come. To enter my contest for a $10 gift card to Dreamspinner Press/Harmony Ink Press, all you have to do is tell me what your preferred pronoun is. You can state your orientation as well, but it’s not mandatory for an entry. My winner will be chosen by Random.org, and I’ll contact them within 24 hours of the end of the hop. If I don’t hear back within 48 hours I’ll choose another winner. Okay, I think that’s all. I’m the cisgender bisexual mother of a trans lesbian, and my pronoun is she/her. Oh, and don’t forget to head back to the main site for the full list of particpants! This entry was posted in Uncategorized and tagged blog hop!, Giveaway, LGBTQ Equality, trans issues by Charley Descoteaux. Bookmark the permalink. she/her is my pronoun and I’m heteroflexible. I go with she/her as well. For myself, I go with she and her. But I always think of the story I read where an ESL student was asked his favorite word in English, and he said “It’s ‘you,’ because I know it’s always right no matter who I’m addressing!” He had come from a language with gendered pronouns and formal pronouns, but ‘you’ was always ‘you’ in English. So, ‘you’ is definitely a cool word. She/her as is my favorite too. Liked your fb page too. Thanks for being a part of the hop! She/her. I am a straight female. Thanks for sharing this with us! My pronoun is she/her and I’m a straight female. My philosophy is to respect what people want to be called unless it’s something profoundly misleading or with the intent to deceive. I had seen the trans* but didn’t understand why it was being used. Thank you for the explanation. This was a really intetesting post. My pronoun is she/he. she/her is my pronoun I’m a Straight Female. I use she and I am heterosexual. Thank you for participating and sharing your story. Thanks for taking part in the hop! My preferred pronoun is she. She/her and I am a straight female. Thanks for visiting, everyone! Random.org has chosen the winner and as soon as I hear back from them I’ll post an announcement. Hope everyone’s enjoying the weekend!